Translated from the French by Jane MacAvock and Abigail Newman (Corpus Rubenianum Ludwig Burchard, Part XIV, 2). London: Harvey Miller Publishers, an Imprint of Brepols Publishers, Turnhout, 2017. 483 pp, fully illus. in color and b&w. ISBN 978-1-909400-96-2. Artistic failures can make for successful art history. 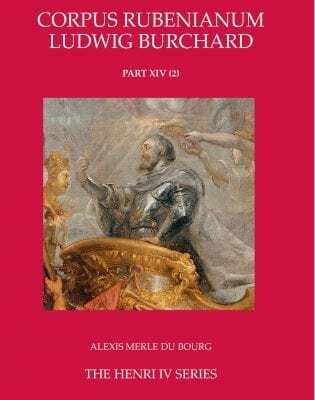 In his magisterial new contribution to the Corpus Rubenianum Ludwig Burchard, Alexis Merle du Bourg charts the inception, development, and ultimate collapse of Rubens’s commission to furnish a gallery of the Luxembourg Palace in Paris with scenes from the life of Henri IV, a successor project to his celebrated Medici Gallery that was ultimately doomed by Maria de’ Medici’s definitive fall from grace in 1631. Building on (and in some cases refuting) the work of such scholars as Ingrid Jost, Julius Held, Bernard Descheemaeker, and Nico Van Hout, Merle du Bourg presents a richly detailed account that goes well beyond the already high standard set by the Corpus Rubenianum series as a whole. Fluently translated by Jane MacAvock and Abigail Newman, this is a readable, lively, and opinionated monograph that exceeds the traditional parameters of the catalogue raisonné. Each entry is exhaustive in its accounts of iconography, provenance, and, where possible, condition. Perhaps an even more significant contribution to the field however, is the extensive historical and interpretative account of the cycle that precedes the catalogue proper. Here, Merle du Bourg provides a wealth of archival details about the protracted negotiations involved in this colossal undertaking, and the tricky logistics of communicating architectural specifications over a significant geographic distance in the early modern period. Completely immersed in the primary sources, Merle du Bourg captures the tension between Rubens’s drive toward antiquarian research and his instincts as a courtier, for example in an extended excursus on the artist’s representation of Henri’s armor, which oscillates between historical accuracy and flattering classicism. Building on his previous publications about Rubens in France, the author also gives a vivid sense of Rubens’s significance as a political actor and threat to French policy, noting that “French diplomatic dispatches reveal unequivocally that he was viewed as a dangerous person who must be watched” (28). As the author admits, the lack of a surviving textual program for the gallery complicates its interpretation, so that “we must compensate for the many lacunae with a series of conjectures bolstered by comparisons, to the extent possible, with the Medici Gallery” (54). Nonetheless, he persuasively situates the gallery within the context of Henri’s posthumous apotheosis as a French national hero who had pacified a nation riven by civil war. For Merle du Bourg, the cycle’s depiction of Henri built on its subject’s “perpetuation of the already-outdated chivalrous ideal, which was nearing obsolescence at the moment at which Rubens was enlisted as its greatest propagandist” (142). At the same time as it clung to the chivalric past, the cycle was also intimately linked to emergent discourses of royal absolutism. On a pictorial level, Merle du Bourg connects the gallery to a shift in French royal taste “in favour of decorating royal residences with more easily intelligible, immediate subjects, illustrating the illustrious moments of the monarch’s reign” rather than “the overly esoteric and hermetic mythological depictions cherished by the Valois” (43). Sara Galletti’s 2008 publication of the sole surviving architectural drawing for the gallery provides the essential groundwork for Merle du Bourg’s reconstruction of the intended sequence of Rubens’s paintings. (A diagram of the proposed reconstruction would have been a welcome addition to the volume’s many appendices). Among the most potentially controversial aspects of Merle du Bourg’s reconstruction is his identification of a fragmentary painting now in Antwerp’s Rubenshuis as the canvas intended to depict the Battle of Ivry. Many previous writers have given that title instead to a monumental, unfinished battle scene in the Uffizi. Merle du Bourg argues convincingly that the Uffizi painting should instead be considered “a generic representation that conveys the sovereign’s transcendent character by evoking his invincibility on the battlefield” (71), making it an apt companion piece to The Triumph of Henri IV, preserved in several oil sketches and another monumental Uffizi canvas. Merle du Bourg is likewise adamant in excluding the problematic so-called “Henri Group” of allegorical images from Rubens’s conception of the gallery. Decrying “the inanity of the notion of autograph works” (172) as applied to Rubens, Merle du Bourg offers a nuanced account of the contribution of Peter Snayers to the series’ topographical battle paintings. Even more admirably, he builds on the work of Geraldine Johnson to provide an updated perspective on the cultural and political achievement of Maria de’ Medici, a much-maligned figure who emerges here as a powerful, if ultimately vanquished, steward of her husband’s legacy. The author resists previous efforts to pinpoint one-to-one correspondences between the Henri and Medici cycles, at the same time as he endorses Jacques Foucart’s argument that the latter is not “an autonomous work, gloriously self-sufficient thank to its author’s inexhaustible inventiveness,” but rather, “only half of a grand design” that remained unrealized (171). In this reading the two cycles reinforce each other in the complementary presentation of two halves of a royal couple, so that “just as Maria is credited with martial virtues, her royal spouse is celebrated for his eminent virtues as protector of the peace” (140-141). Another recurring theme is the difficulty posed by Henri’s original Protestantism and service to that faith during the Wars of Religion, a challenge of tact similar to those posed by Maria’s own checkered career and vexed relationship with her son. Merle du Bourg convincingly, if unsurprisingly, connects the suppression of these aspects of Henri’s biography from Rubens’s cycle to anti-Huguenot policies of the 1620s. Merle du Bourg concludes his account on an elegiac note, lamenting the “irremediable gap in the trajectory of seventeenth-century history painting” (174) left by the Henri cycle’s failure. This perhaps understates the legacy of the Medici cycle itself, which proved a sustained source of inspiration for French painters as disparate as Watteau and Delacroix. At moments, Merle du Bourg shares a general tendency of the Rubens literature to lapse into a panegyric mode that recalls the baroque court culture he so ably interprets. Thus, the author writes that in the oil sketch of the Reduction of the City of Paris, now in Berlin, Rubens works “with supreme ease to produce an incomparable illustration of one of the most extraordinary instances of Henri IV’s heroism” (172). Supreme, incomparable, and extraordinary, Rubens is an artist who regularly rouses art historians to hyperbole. Fortunately, in this case he has also inspired an exemplary work of research and interpretation.